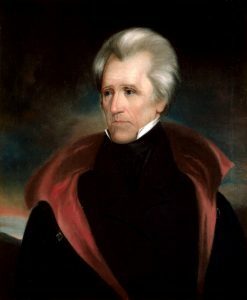 When President Trump hung a portrait of President Andrew Jackson in a prominent spot in the Oval Office, in hopes that Americans would associate Trump with the controversial president who fought for the “common man,” it helped put Jackson back in the public discourse. Jackson – unusually for his day – carefully crafted his public image – one thing the two presidents have in common. And UA assistant professor of art history Dr. Rachel Stephens is helping to clarify that conversation. 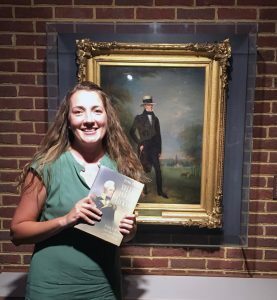 Stephens’ monograph – the first book-length study of Andrew Jackson’s personal portrait artist – has recently hit the bookshelves. 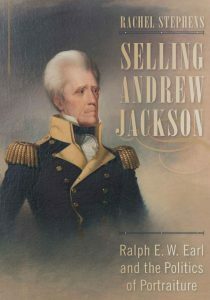 Selling Andrew Jackson: Ralph E. W. Earl and the Politics of Portraiture, from the University of South Carolina Press was published in June 2018. In it, Dr. Stephens examines the role of Earl, Jackson’s “Court Painter,” in Jackson’s inner circle and the influence of his portraits on Jackson’s political career and historical legacy. What will we learn about Andrew Jackson by reading your book that we didn’t know before? RS: Andrew Jackson’s reputation precedes him, but few realize that he actually hired a full-time artist. Artists were always clamoring to paint the early presidents, and dozens of artists painted Jackson, but in order to control his own visual message, he hired Earl’s services full time, and Earl even lived at Jackson’s plantation and at the White House. I believe that Earl and Jackson collaborated on the portraits, and that each one was intended to respond to the current events of Jackson’s life. Earl and Jackson became very close friends over the course of their 21-year friendship, and Earl is buried in the Jackson family cemetery at the Hermitage. How many paintings total did Earl paint of Andrew Jackson? RS: Earl painted untold numbers of portraits of Jackson. He painted him almost daily for fifteen or more years. An unfinished portrait of Jackson was on his easel when he died. The exact number is impossible to calculate because Earl didn’t sign his works and records for them do not exist, but there are dozens of them! How many times a day did Earl paint images of AJ? RS: Seemingly, Earl was employed full time in painting Jackson. Visitors to Jackson’s White House regularly mention Earl at his easel in the background or in his studio. Depending on the nature of the portrait, it might take Earl anywhere from a few days, to over a year to complete a portrait. What’s the most important thing you hope to communicate to readers with this book? RS: I’m so happy to see the book in print! I hope it will educate readers about the significant impact that Ralph E. W. Earl had on Jackson’s career and also the importance of his contribution to American Art. Rachel Stephens is an assistant professor of art history in the Department of Art and Art History at The University of Alabama. Her research investigates the art and visual culture of the antebellum era, particularly in the South. For more information about The University of Alabama’s programs in studio art and art history, go here: https://art.ua.edu/academics/graduate-programs/art-requirements/.